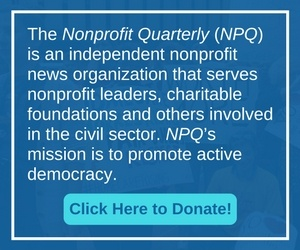 Click the cover image below to read and download the Summer 2012 digital issue of the Nonprofit Quarterly. The authors describe what it took for two organizations in crisis to begin their journeys back to financial and operational health. “Crowding out,” “venture philanthropy,” “social enterprise,” “game theory”. . . . Is it time for nonprofits to push back against this invasion of for-profit models and trends, and cultivate our own management frameworks? NPQ has a hoard of world class articles on management that inform our thinking and we often will recirculate pieces that we think need to be reconsidered. This classic by Gregory Saxton on participatory leadership and management is so thorough that some facet of it will be thought provoking even for the most cutting edge leaders. Our summer 2012 issue looks at the external influences on nonprofit management—so let’s talk about those governing the Nonprofit Quarterly.